Hunter Douglas Architectural has introduced the first modular felt ceiling system in the world. HeartFelt is an advanced, budget-friendly, attractive linear ceiling system that generates a warm ambience, offers exceptional acoustic control and is sustainable by design. For thousands of years, felting has been a popular method for creating textiles. Designers across the world have used this intriguing material with its unique structure and soft appearance to produce iconic designs, in clothing garments, furniture and fashion accessories. Inspired by these, Hunter Douglas has created this new application that is not only functional, but also pleasing to both the eye and ear. Felt has long been associated with sound absorption and the HeartFelt Ceiling System is no exception. The felt’s sound-absorbing qualities, when combined with the design of the ceiling, can have a dramatic effect on how sound moves around a space. The system can be specified in a multitude of forms with panel widths, distance between panels and ceiling height all determining the acoustic performance of a building. Each panel is box-shaped and easily clicks onto the specially designed carrier system. 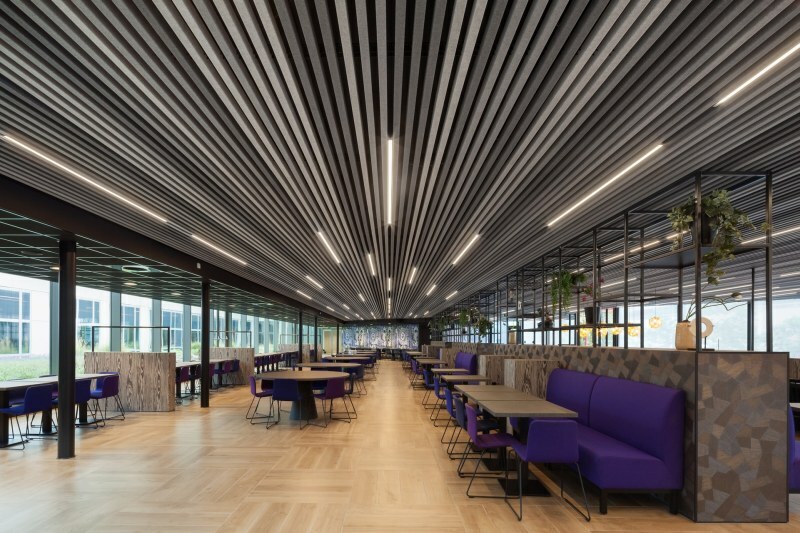 By changing the distance between the panels and varying the height and location within the space, architects and designers can utilise the ceiling to play a pivotal role within the overall design of the interior. The design flexibility of the HeartFelt system has seen the product also being used on interior walls, for which Hunter Douglas has developed a special carrier system. HeartFelt is currently available in five different shades of grey: Off-white, light grey, middle grey, dark grey and anthracite. These soft colour tones are interchangeable to add to the visual feature that the ceiling system brings to a room. Felt is ideal for use in environments including health, education, commercial buildings, offices and retail establishments. It offers ease of access to the plenum, and is simple to keep clean and maintain with either a feather duster or vacuum cleaner. HeartFelt linear ceiling panels are made of non-woven thermoformed polyester fibres. They are 100% recyclable and have received a C2C bronze certificate from the Cradle to Cradle Products Innovation Institute. The carrier and suspension system, which are produced from aluminium and galvanised steel, are also 100% recyclable and reusable. They are dust- and dirt-resistant and are certified to the indoor European standard EN 15251. HeartFelt is a fully patented product that complies with the leading criteria regarding the emission of volatile organic compounds (VOCs) and has a fire certification to EN 13501 Class B, S1, d0. The product also complies with the low demands for use in non-polluting buildings. Caption: The HeartFelt Ceiling System easily clicks onto the specially designed carrier system and the distance between the panels can be adjusted.